These two contrasting books about William Friese-Greene came through my letterbox this week. In the Blue Corner we have “Close-up of an Inventor” from 1948, written (under a pseudonym) by Muriel Forth, a journalist for women’s magazines . Conspicuous by its absence is any section at the back which explains what her sources were. This shows – many misnomers are recycled and amplified. That said, she had the enormous benefit of spending a lot of time with Ethel, Friese-Greene’s first child, who was already a young adolescent when he was creating his first film camera, so she remembers plenty of detail. Her future husband was also around in that time. Plus, Ms Forth had access to a wealth of documentation which has since been dispersed and/or lost. So if a book can simultaneously be a treasure trove AND a minefield, this is it. I haven’t read it in many, many years and it’s good to be able to enjoy the stories it contains whilst not being misled about certain factual and technical details. 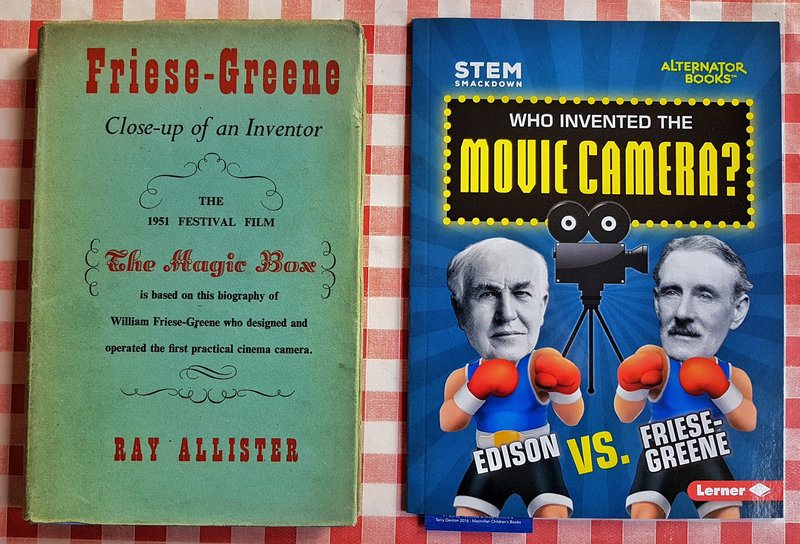 70 years separates these two works, but it’s encouraging to the likes of me to see that the story of Mr. Friese-Greene won’t just quietly go away. Egon Larsen (1904-1990) was a German science journalist and writer. Chapter three in this book covers the story of William Friese-Greene, The Man with the Magic Box. Pages 47-68. Includes three black and white photographs.